We could all use a little boost in productivity from time to time. When Sunday evening rolls around, we have high hopes for a productive work week. When we get up and start working on Monday, often we spend most of the morning prepping ourselves for the week; which eats up a significant chunk of our time. Before we know it, we have spent most of our Monday working just to set ourselves up for the rest of the week. Talk about a direct hit to productivity; we end up stopping dead in our tracks before progress even gets going. Between a constant flood of emails, phone calls, voicemails and text messages to attend to, and your growing to do list, Monday mornings are that really dreaded part of the week...And it doesn’t have to be that way. We can start our work week off right by taking a few of those Monday morning tasks and starting them Sunday. I know, I know; before you start telling me “I don’t work on the weekends,” hear me out. You can take roughly an hour of your day on Sunday and prepare yourself for a very productive week. You would be surprised at how much time you can save come Monday when you spend just one hour getting things ready on Sunday. By Sunday there are tons of things swirling through your head that you know you will have to do come Monday. Take a few minutes and add those things to your to do list? You can spend five minutes updating your list with all of the things you know you have to do, so you can get back to enjoying your weekend. The same can be said about updating your to do list as well. I'm not sure about you, but when I get to working on things, I often tend to forget to review my list and mark off things that I have already done. 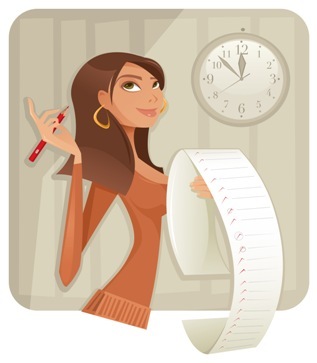 This is a good time to go through your list and make sure it is up to date, which will allow you to focus your time on Monday toward things on your to do list instead of on updating it. Write out any due dates for your tasks, and highlight your most pressing items. Not only should you be able to see at a glance when things are due, you should also have it glaring which items need your desperate attention when you sit down for work on Monday. You can use the quiet of Sunday to determine your most critical items and not let incoming tasks on Monday distract you from what you determined is most important the night before. While this could be a dangerous thing, going ahead and poking through your inbox, for the most part, will help save time in the morning. Take about 15-30 minutes and that will surely save you some time come Monday. For instance, we all get email such as advertisements, newsletters, and weekly email reminders. We know these messages are coming and will be there no matter what. Why not go ahead and go through all of them you have and get rid of them? Read them, file them away, or delete them. Whatever you would be doing Monday morning with these messages, go ahead and take care of them now. That way, you don’t feel like you are working, but you are making way to a smaller unread inbox and can focus on actual emails that need your attention. If you are brave enough (and willing to give up the time on your weekend to do it), you could even go through your email to see what to expect come Monday. Are there clients emailing you wanting simple tasks done? Go ahead and add it to your to do list. That makes it one less message to deal with in the morning. But, this is only for the brave and or those who are bored on Sunday. Social media networks can often be a distraction and a time-sucker for most of us, especially if our jobs require frequent use of these networks. Since we often step away from these social networks during the weekend to spend time with friends and family and do other things, we could quickly fall behind and it can take tons of time on Monday morning to see what we missed. If you follow social media networks such as LinkedIn, Twitter and Facebook, you can spend a few moments on Sunday night getting caught up on the updates. Doing this the night before a really busy morning will help you limit how much time you spend catching up on these social media networks on Monday morning. While you won’t get completely caught up (because there will be updates coming in while you sleep), you can help significantly cut down the time spent on these networks on Monday when you should be focusing on powering through your tasks and the growing inbox count. Are there any tasks you do on Sunday to help boost your productivity for the week? Leave us your comments below!